(a) Premises. Landlord hereby leases to Tenant and Tenant hereby leases from Landlord the Premises as improved or to be improved with the Tenant Improvements described in the Work Letter Agreement, a copy of which is attached hereto as Exhibit "C". (b) Mutual Covenants. Landlord and Tenant agree that the letting and hiring of the Premises is upon and subject to the terms, covenants and conditions contained in this Lease and each party covenants as a material part of the consideration for this Lease to keep and perform their respective obligations under this Lease. (c) Tenant's Use of Common Areas. During the Term of this Lease, Tenant shall have the nonexclusive right to use in common with Landlord and all persons, firms and corporations conducting business in the Development and their respective customers, guests, licensees, invitees, subtenants, employees and agents (collectively, "Development Occupants"), subject to the terms of this Lease, the Rules and Regulations referenced in Paragraph 28 below and all covenants, conditions and restrictions now or hereafter affecting the Development (provided Tenant's use of the Premises as contemplated herein is not materially and adversely impacted), the following common areas of the Development (collectively, the "Common Areas"): the parking facilities of the Development which serve the Building, loading and unloading areas, trash areas, roadways, sidewalks, walkways, parkways, driveways, landscaped areas, and similar areas and facilities situated within the Development and appurtenant to the Building which are not reserved for the exclusive use of any Development Occupants. If Landlord hereafter grants reserved parking to any other Development Occupants, then Tenant may demand that Landlord grant to Tenant substantially similar reserved parking rights for the Premises and any other space leased by Tenant pursuant to this Lease. (d) Landlord's Reservation of Rights. Provided Tenant's use of and access to the Premises is not interfered with in an unreasonable manner, Landlord reserves for itself and for all other owner(s) and operator(s) of the Common Areas and the balance of the Development, the right from time to time to: (i) make changes to the design and layout of the Development, including, without limitation, changes to buildings, driveways, entrances, loading and unloading areas, direction of traffic, landscaped areas and walkways, parking spaces and parking areas; and (ii) use or close temporarily the Common Areas, and/or other portions of the Development while engaged in making improvements, repairs or alterations to the Building, the Development, or any portion thereof. 3. TERM. The term of this Lease ("Term") will be for the approximate period designated in Subparagraph 1(f), commence on the Commencement Date designated in Subparagraph 1(i), and end on the Expiration Date designated in Subparagraph 1(h) unless the Term of this Lease is extended pursuant to any provision of this Lease or written agreement of the parties. Each consecutive twelve (12) month period of the Term of this Lease, commencing on the Commencement Date, will be referred to herein as a "Lease Year". Landlord's Notice of Lease Term Dates ("Notice"), in the form of Exhibit "D" attached hereto, will confirm the Commencement Date and the date upon which the Term of this Lease shall end, and will be delivered to Tenant after Landlord delivers possession of the Premises (defined in Paragraph 4(a) below) to Tenant and a punch-list has been prepared. (a) Delivery of Possession. Landlord agrees to deliver possession of the Premises to Tenant in accordance with the terms of the Work Letter Agreement attached hereto as Exhibit "C". 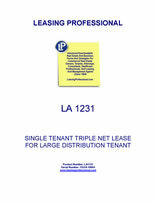 Landlord will not be obligated to make any portion of the Premises available to Tenant until Landlord has received from Tenant all of the following: (i) a copy of this Lease fully executed by Tenant; (ii) the first installment of Monthly Base Rent on the portion of the Premises to be made available (as contemplated in Paragraph 5(a) below); (iii) executed copies of policies of insurance or certificates thereof as required under Paragraph 19 of this Lease, (iv) copies of all governmental permits and authorizations, if any, required in connection with Tenant's operation of its business within the Premises; and (v) if Tenant is a corporation or partnership, such evidence of due formation, valid existence and authority as Landlord may reasonably require, which may include, without limitation, a certificate of good standing, certificate of secretary, articles of incorporation, statement of partnership, or other similar documentation. (b) Condition of Premises. Thirty (30) days following the Rent Commencement Date and in accordance with the Work Letter Agreement attached hereto as Exhibit "C", Landlord and Tenant will jointly conduct a walk-through inspection of the Premises and will jointly prepare a punch-list ("Punch-List") of items required to be installed by Landlord under the Work Letter Agreement which require finishing or correction. The Punch-List will not include any items of damage to the Premises caused by Tenant's move-in or early entry, if permitted, which damage will be corrected or repaired by Landlord, at Tenant's expense or, at Landlord's election, by Tenant, at Tenant's expense. Other than latent defects of which Landlord is notified within one (1) year after the Rent Commencement Date, Landlord's obligations under Paragraph 14 of this Lease, and the items specified in the Punch-List, by taking possession of the Premises, Tenant will be deemed to have accepted the Premises in its condition on the date of delivery of possession, subject to all applicable zoning, municipal, county and state laws, ordinances and regulations governing and regulating the use and occupancy of the Premises and to have acknowledged that the Tenant Improvements have been installed as required by the Work Letter Agreement and that there are no additional items needing work or repair by Landlord. Landlord will cause all items in the Punch-List to be repaired or corrected within thirty (30) days following the preparation of the Punch-List or as soon as practicable after the preparation of the Punch-List. Tenant acknowledges that neither Landlord nor any agent of Landlord has made any representation or warranty with respect to the Premises, the Development or any portions thereof or with respect to the suitability of same for the conduct of Tenant's business. The foregoing inspection of the Premises may hereinafter be referred to as the "Inspection Process." Landlord and Tenant acknowledge and agree that the Inspection Process shall be applicable to each portion of the Subleased Premises as such portions are turned over to Tenant and the respective subtenants thereof in accordance with the terms of this Lease. (c) Early Entry. Landlord hereby provides Tenant notice of the substantial completion of the Building shell. Tenant may elect to enter upon the Premises forty-five (45) days prior to the Rent Commencement Date in order to install communications cable, fixtures and racking and the like, at Tenant's sole cost and expense (collectively, "Tenant's Work"). Any such entry by Tenant for the purpose of Tenant's Work will be subject to the following conditions: (i) Tenant, together with its employees, agents, independent contractors, suppliers and any other personnel under Tenant's control ("Tenant's Personnel") entering the Premises, will cooperate with Landlord and Landlord's general contractor; (ii) Tenant agrees that any such early entry is subject to all of the terms and conditions of the Lease except for those relating to the payment of Rent and other monetary obligations, which provisions will become applicable in accordance with the terms of this Lease; (iii) Prior to any entry upon the Premises by Tenant or Tenant's Personnel, Tenant agrees to pay for and provide to Landlord certificates evidencing the existence and amounts of liability insurance carried by Tenant, which coverage must comply with the provisions of this Lease relating to insurance; (iv) Tenant and Tenant's Personnel agree to comply with all applicable laws, regulations, permits and other approvals required to perform Tenant's Work or by the early entry on the Premises by Tenant and Tenant's Personnel; (v) Tenant agrees to indemnify, protect, defend and save Landlord harmless from and against any and all liens, liabilities, losses, damages, costs, expenses, demands, actions, causes of action and claims (including, without limitation, attorneys' fees and legal costs) arising out of the early entry, use, construction, or occupancy of the Premises by Tenant or Tenant's Personnel; and (vi) Tenant shall have paid to Landlord the first full monthly installment of Monthly Base Rent on the portion of the Premises to which Tenant desires early entry. If, in Landlord's reasonable judgment, Tenant's Personnel and/or the work that is being performed by Tenant's Personnel interferes with Landlord's construction of the Tenant Improvements, or detrimentally affects Landlord's ability to comply with its commitments for completing its improvements on the Premises or cause labor difficulties, Landlord will have the right to order Tenant's early entry to cease in the event Tenant has not taken action to remedy such interference within forty-eight (48) hours following Landlord's notice to Tenant of the existence of the same, and if Landlord so requires in connection therewith because such items are interfering with Landlord's Work, Tenant agrees to cause Tenant's Personnel to remove all tools, equipment and materials from the Premises. (a) Monthly Base Rent. Tenant agrees to pay Landlord the Monthly Base Rent for the entire Premises (subject to adjustment as hereinafter provided) in advance on the first day of each calendar month during the Term without prior notice or demand, except that Tenant agrees to pay to Landlord the Monthly Base Rent on the respective portions of the Premises made available to Tenant for the first full month of the Term (that is, the first full month immediately following the Rent Commencement Date) on the earlier of being granted access thereto or the Rent Commencement Date. For purposes of this Lease, the "Rent Commencement Date" shall be deemed to be the earlier of _______________ or the date Tenant commences the operation of its business within any portion of the Premises. If the Term of this Lease commences or ends on a day other than the first day of a calendar month, then the rent for such period will be prorated in the proportion that the number of days this Lease is in effect during such period bears to the number of days in such month. All rent must be paid to Landlord, without any deduction or offset, in lawful money of the United States of America, at the address designated by Landlord or to such other person or at such other place as Landlord may from time to time designate in writing. Monthly Base Rent will be adjusted during the Term of this Lease as provided in Exhibit "B". (b) Additional Rent. All amounts and charges to be paid by Tenant hereunder, including, without limitation, payments for Operating Expenses, real property taxes, insurance and repairs, will be considered additional rent for purposes of this Lease, and the word "rent" as used in this Lease will include all such additional rent unless the context specifically or clearly implies that only Monthly Base Rent is intended. (c) Late Payments. Late payments of Monthly Base Rent and/or any item of additional rent will be subject to interest and a late charge as provided in Subparagraph 22(f) below.